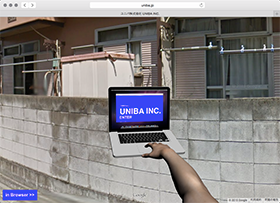 I made a work called "HYPER INTERNET 3D" for Uniba inc.
You can view in a browser that supports WebGL. And , you can start the "HYPER INTERNET 3D" anywhere if you use this bookmarklet. It may not work on some web pages. Please try at a different page.